I’m really pleased to let you all know that I’m running a new giveaway on Goodreads for my latest book – The Lost Sentinel. Please click the link below to enter. Giveaway ends October 12, 2017. I’m working hard to get the second instalment finished for publication in 2018, so watch this space for further news. I can’t believe I’ve been away from blogging for the whole summer holidays. The time has flown by while I’ve been busy working on book 2 in the Silent Sea Chronicles and attempting to entice the kids away from their XBox’s with days out and holidays. Now they’re both back at school, it’s time for me to get serious about finishing The Sentinel’s Reign ready for publication in 2018. I also plan to take part in NaNoWriMo this year and beat the 50K word count. I’m hoping to make a slow return to blogging over the next few weeks with book reviews, photo posts and a guest post from Colleen Story about research and how she approaches it for fiction and non-fiction. I will also be reviewing her new book ‘Overwhelmed Writer Rescue’. It’s a brilliant self-help book and I can’t wait to share my review with you. In the meantime, I’m really pleased to announce the new kindle countdown deal for The Lost Sentinel has just gone live this morning. You can pick it up at the bargain price of 99p / 99c for the next week Amazon universal link. I’m hoping to achieve the same success as the previous countdown deal for Visions of Zarua. See my results post from July. This time I’m trying out a few new ad companies. If it goes well (or maybe if it doesn’t) I’ll share the results with you next week. 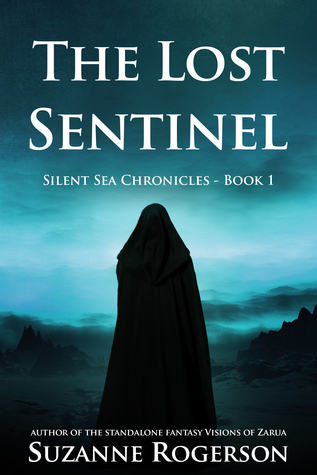 I’m keeping my fingers crossed as The Lost Sentinel is feeling a bit like a neglected child at the moment while I’ve been so busy working on the sequel. It has been a manic few months of planning, answering questions and dreaming up guest posts, but now the blog tour has come to an end. I’ll keep checking back over all the posts and replying to any comments, but right now I wanted to take the opportunity to thank everyone who took part, everyone who liked, commented and shared, and of course thanks to those who were kind enough to review my new book. I do have a big apology to make to two bloggers, who I included in the tour to post reviews, but due to email errors at my end they hadn’t been aware they were actually supposed to post reviews on these dates. Sorry Susan – Books from Dusk till Dawn and Mirjana – Oloriel Moonshadow/Cyanide and Cherries. Yahoo has been doing some funny things with my emails, and somehow I didn’t realise these two slipped through and were not sent / received. Running a blog tour with 17 bloggers over 16 days, it was inevitable something would go wrong, but still… I should have been on top of it. Below, I’ve added links to each post over the 16 day blog tour, so please check out any you may have missed. 11th June – Sue Vincent – Guest Post 5 ways spreadsheets can help writers plan and edit their novels. 16th June – Sacha Black – Guest Post – 12 things to ask yourself before writing a series. Thank you again to everyone who took part in the blog tour. I’ve had a lot of fun, but it’s also been an exhausting experience. I have so much sleep to catch up on, plus there’s cleaning to be done and book 2 is still waiting to be finished! The Lost Sentinel ebook is about to finish its promo price and will so be £2.99, so jump in quick if you want to catch it at 99p / 99c. It’s enrolled in Kindle Unlimited. I’ve also just set up a Goodreads Giveaway, so why not to win a paperback copy in the worldwide giveaway running until 17th July. Finally, I will be taking a break from blogging. Everyone is probably fed up of these posts by now anyway, and I really want to get on with book 2 while the kids are still at school. Only 3 and half weeks to go! I need to put in some serious writing time. I can’t believe The Lost Sentinel has been published just over a week. With the blog tour coming to an end on Monday, I’ve set up a WORLDWIDE GIVEAWAY. Someone will win a paperback copy, could it be you? The kindle edition is still 99p / 99c for the next few days – Amazon Universal link – and it’s free to read to everyone enrolled in Kindle Unlimited. I’m looking to get more reviews on Amazon, so if you have read it, or are intending to read, please consider leaving a review in the future. It only takes a few minutes and doesn’t need to be an essay, unless you want to write one that is. Goodreads has 7 reviews so far (not bad after only a week of publication!). You can click on the link above to read these reviews. Next weekend I’ll be holding my second ever book event! A pirate themed school fair, which fits my book perfectly. I’ll post up some pictures and share how the day went. Enjoy the rest of your weekend, and I hope you can join me for the last few posts of the blog tour. After years of writing, months of editing and weeks of planning, The Lost Sentinel is now available to buy on Amazon and free to read if you are enrolled in Kindle Unlimited. I’m keeping the 99p / 99c pre order price discount running for the duration of the blog tour, so it’s not to late to pick it up at the bargain price. Talking of the blog tour I’ll be sharing two posts today on day 6 of the tour. A guest post aimed at writers ’12 questions to ask yourself before writing a trilogy or series’. And a book review. I hope you can join me on the rest of the tour. And if you do decide to take a chance and pick up The Lost Sentinel, please consider leaving a review. There is just under a 1 month to go until the publication of The Lost Sentinel and I’ve been very busy. The paperback cover is complete and I love the design. Thanks so much to The Cover Collection for their brilliant artwork and swift service. The proof copy is ordered and already on its way from Createspace. I’m adding the final touches to the kindle edition (hyperlinks etc). ARC’s have been going out to reviewers. I’ve agreed a book stall at my daughter’s summer fair, and am thinking of contacting the local newspaper to see if they’d be interested it featuring the event. Oh and I’m about to be 40! I have a couple of cool birthday treats lined up; visiting the caves at Cheddar Gorge, the Roman baths at Bath, and a falconry day. All great fun, but also research and photography opportunities. I haven’t decided whether to do a blog tour or not yet, as I’m struggling to think of material. Some book reviewers and bloggers have already agreed to do posts around the publication date so I need to get organised and book in some dates. This is where I put out the call for help. Would you be willing to post something about The Lost Sentinel before or after the 16th June? I’m happy to do interviews etc. I’m also still looking for more reviewers. You don’t have to commit to the publication date, I’m happy to be reviewed however it fits in with your schedule. Lastly, I was very happy to see this email in my inbox this morning. You’ve got to love Amazon and Author Central – follow the author facility. It’s a must for all authors. You have subscribed to new release e-mails for Suzanne Rogerson. You won’t want to miss this new book. Please get in touch, and have a great day.